Want to know what you can afford? Our Austin mortgage pre-approval allows for quick pre-approval by some of the best experts in the business. We’ll let you know exactly what your mortgage approval range is so you can begin your house hunt!! Before even looking for your first house, you can get pre-approved for a loan ensuring the rest of the process is hassle-free. CapFi Lending can help you get pre-approved and on your way to home ownership! Contact one of our local Austin based purchase specialists today to start your pre-approval today. Why Should You Get Pre-Approved with CapFi Lending? CapFi Lending will provide a FREE home loan consultation; then deliver a finance pre-approval letter that can be provided to your realtor to get the home search started! 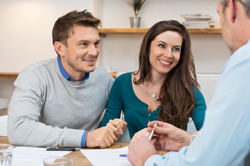 During our initial process we will ask about your current income, assets, and liabilities. Our Austin based loan specialist will also want to discuss your real estate goals so that they can tailor a mortgage to fit your needs. CapFi Lending’s ultimate goal is to set you up for success when approaching the home buying process for a fast and smooth closing of your new home! Once we have been able verify your documents, we will able to provide a full mortgage rate quote and fee sheet showing exactly how the loan will transact.